Being part of The Distributors national grocery, convenience and confectionery wholesaler network we service the below geographic region. 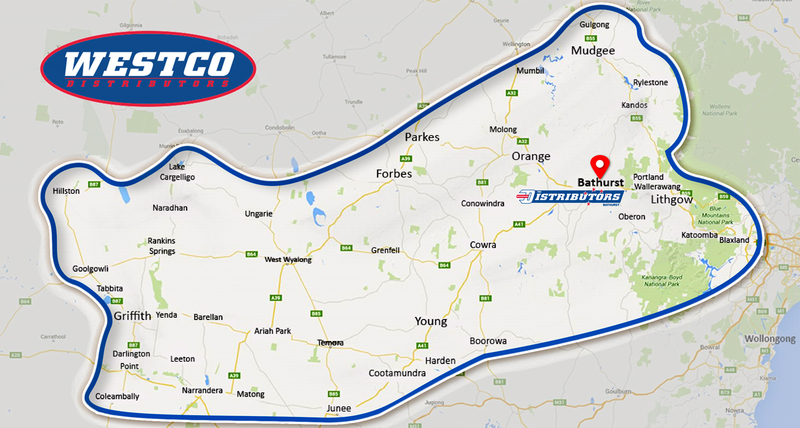 We’ve also specifically outlined the postcodes that fall within our service area, as well as the suburbs that we will deliver to. If you have any questions please don't hesitate to get in touch and we'll be happy to discuss. 2586, 2587, 2588, 2590, 2594, 2652, 2665, 2666, 2668, 2669, 2671, 2672, 2675, 2680, 2681, 2700, 2703, 2705, 2706, 2707, 2725, 2774, 2776, 2777, 2778, 2780, 2782, 2783, 2785, 2786, 2787, 2790, 2791, 2792, 2793, 2794, 2795, 2797, 2798, 2799, 2800, 2804, 2805, 2806, 2807, 2808, 2810, 2845, 2846, 2847, 2848, 2849, 2850, 2852, 2864, 2865, 2870, 2871. Ardlethan, Ariah Park, Barellan, Barmedman, Bathurst, Beckom, Beelbangera, Bilbul, Blackheath, Blaxland, Blayney, Borenore, Boorowa, Bowenfels, Canowindra, Capertee, Caragabal, Carcoar, Cargo, Coleambally, Cootamundra, Cowra, Cudal, Cullen Bullen , Darlington Point, Eglinton, Eugowra, Faulconbridge, Forbes, Forest Reefs, Goolgowi, Gooloogong, Grenfell, Griffith , Grong Grong, Gulgong, Hanwood, Harden, Hartley, Hillston, Kandos, Katoomba, Koorawatha, Lake Cargelligo, Lake Wyangan, Lawson, Leeton, Leura, Lidsdale, Lithgow, Lucknow, Lyndhurst, Mandurama, Manildra, Marrangaroo, Meadow Flat, Medlow Bath, Merriwagga, Millthorpe, Mirrool, Mount Victoria, Mudgee, Murrumburrah, Narrandera, O'Connell, Oberon, Orange, Parkes, Perthville, Portland, Rankin Springs, Rylstone, Sofala, South Bowenfels, Spring Hill , Springwood, Temora, Tharbogang, Tullibigeal, Ungarie, Wallendbeen, Wallerawang, Wattle Flat, Weethalle, Wentworth Falls, West Wyalong, Whitton, Winmalee, Wombat, Woodford, Woodstock, Yanco, Yenda, Yetholme, Yoogali & Young.